The church was built on what was probably the site of a Roman temple. It was documented in 1025 and again in 1178, when it belonged to the Abbazia di San Silvestro. The Emperor Henry VI separated it from San Silvestro and took it under his protection in 1187, from which point it was administered by a college of canons. The Romanesque base of the campanile to the left of the façade dates to the 12th century. [A bell cast in 1209 that was originally in this tower is now in the Pinacoteca Comunale]. According to its inscription, Bencivenni da Pisa cast it when Giacomo da Bevagna was Prior. The Maccarelli family financed the restoration of the church in 1285. At that time, a community of secular canons administered it, but in 1298 they became regular canons, holding their property in common. The foundation remained important throughout the 14th century, but subsequently declined. Prior Marino d’ Agostino, who served in 1449-63 and then from 1475 until his death in 1499 was responsible for the revival of the fortunes of Santa Maria Maggiore in the second half of the 15th century. The process continued under Troilo Baglioni (1499-1501) and Leone Baglioni (1507-39, the illegitimate son of Troilo’s powerful brother, Gian Paolo Baglioni). 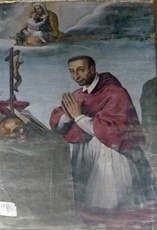 Bishop Francesco Eroli of Spoleto consecrated the new high altar in 1513, during what was a major period of renovation. 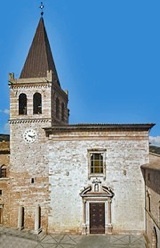 The church of Santa Maria di Armenzano was subordinated to Santa Maria Maggiore in 1562, followed by the church of San Rufino di Spello in 1564. The church was re-modelled in the period 1644-90, when the façade was moved forward to form an additional bay within the church at the expense of what had been a portico. The fluted marble columns at its base of the campanile (visible in the photograph above), which probably came from a Roman building, may have been re-used in this portico. A relic of St Felix, which was acquired from the Abbazia di San Felice in Giano in 1783, was preserved on the Altare di San Felice (see below) in a reliquary (1788) that is now in the Pinacoteca Civica. The relic was subsequently moved to the present reliquary on this altar (illustrated here), perhaps in 1883, when the earlier reliquary was restored. The community of canons was suppressed in 1860. As noted above, the facade was built in front of the original structure when the nave was extended in 1644. The jambs of the new portal incorporate fragments of the original façade (12th century). Following this modification, the facade of the church continued the line of the original campanile (13th century). A second bell tower, the so-called Campanile dell’ Annunziata, was built behind and to the left of the church in 1527 to a design by Rocco di Tommaso da Vicenza. The church has a single nave, a transept and an apse. There were originally chapels off each side of the nave, but those to the right were closed in 1510 to form a loggia that is accessed from the right transept. The arches of this loggia were later closed, as can be seen from the courtyard of Palazzo Priorale (see Walk I). The water stoup on the right has been adapted from a Roman funerary altar dedicated to Caius Titienus Flaccus (CIL XI 5287), a sevir (member of a college of six magistrates), equo publico (a member of the equestrian order whose horse was provided at public expense) and aedile. His ashes were originally preserved inside the marble block. He is shown in relief on horseback on the front of the block, signifying the importance of the importance he attached to his publicly-provided horse. This area of the church retains a number of elements from the remodelling of the early 16th century. The high altar bears the arms of Bishop Francesco Eroli, who consecrated it in 1513. The carved choir stalls (1512-20) behind it are by Pier Nicolò di Spoleto. The ciborium (1512-5) over the high altar is by Rocco di Tommaso da Vicenza. This damaged fresco, which is signed by Cola Petruccioli and, can be seen on the left of the apse, behind the choir stalls. It was probably originally part of a cycle of scenes from the life of Christ that was largely destroyed when the presbytery was re-modelled. [A fragment from it showing the head of Christ is now in the Cappella dei Canonici (see below)]. The octagonal marble font by Gasparino di Pietro, which stands to the right of the entrance, bears the arms of Bishop Francesco Eroli. It contains figures in relief on seven of its eight sides, each of which is identified by inscription and represents one of the churches that were subordinated to Santa Maria Maggiore. The figure (1563) of the Risen Christ at the pinnacle is by Gian Domenico da Carrara. One of the figures in relief probably originally represented St Rufinus. However, the inscription was changed at a later date to read: “S. FELIX EPISCOPUS HISPELLAS”, presumably in an attempt to document an alleged historical attachment between Santa Maria Maggiore and St Felix. These panels were commissioned for two altars (1515) that Rocco di Tommaso da Vicenza built on the pilasters that flank the presbytery. He negotiated a contract for their altarpieces with Giannicola di Paolo in 1520, but this contract was never honoured, and the work was commissioned from the elderly Perugino in 1521. 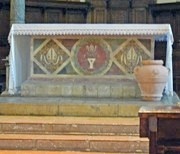 The stone pulpit, which is in the left at the end of the nave, is by Simone da Campione. It bears the Venanzi family, and the inscription records that they commissioned it. This altarpiece on the Altare di Santa Monica (the 1st on the left) is attributed to Giovanni Battista Pacetti, lo Sguazzino. This altarpiece on the 4th altar on the right is attributed to Giacomo Giorgetti. The figure at the lower left might be a portrait of the donor, who was probably a member of the Dominici family: it has also been suggested that it is a self-portrait of the artist. •the Altare della Madonna di Loreto, on the right. ✴the Immaculate Virgin with SS Agnes, Antony of Padua, Felix, Clare and a female saint on the left of the left transept, which came from Santa Chiara. This altarpiece on the altar to the left of the entrance to the Cappella Bella) is by the important local artist, Elvio Marchionni. This chapel (the 2nd on the left) is known as the Cappella Bella, in honour of its magnificent frescoes (1501) by Pintoricchio. 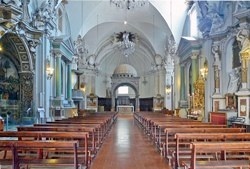 It was originally the Cappella del Sacramento, but this function was transferred to the ex-sacristy (the present Cappella del SS Sacramento - see below) in 1875, when the Cappella Bella was closed for restoration. 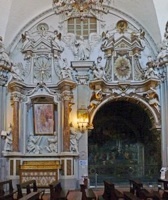 This chapel is off the left transept, which originally served as the sacristy, was commissioned by Prior Marino d’ Agostino from the Lombard masters, Antonio and Giovanetto. It seems to have been designated as the Cappella del Sacramento in 1875, because the Cappella Bella, which had previously served this purpose, was closed for restoration at that time. ✴Pollione di Gasparo da Foligno, who executed it. This angel is painted above a washbasin (16th century). The inscription reads “LAVAMINI ET MUNDI ESTOTE” (wash yourself and be pure). It is attributed to Pintoricchio, and was probably painted while he was at work in the Cappella Bella. ✴a figure of the Risen Christ above. ✴the descent of the Holy Spirit (illustrated here). ✴the Virgin of Mount Carmel (Virgin intercedes with Jesus for the souls in Purgatory), with [which saint ??] and a townscape of Spello below. 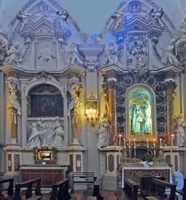 This chapel is behind the Cappella del Sacramento, off the left transept. This fragment came from the fresco of Christ’s agony in the garden in the apse (see above), which is signed by Cola Petruccioli ]. This detached and largely repainted fresco is sometimes attributed to Pintoricchio, but it has more recently been attributed to Giovanni di Pietro, lo Spagna, who might have been involved in Pintoricchio’s work in the Cappella Bella. This was the central panel of a polyptych that was probably originally commissioned for the high altar. Following a recent restoration, the surviving side panels and predella panels have been attributed to the Maestro dell’ Assunta di Amelia: they are now in the Pinacoteca Comunale (see below). The central panel was presumably also originally the work of the Maestro dell’ Assunta di Amelia. However, it was extensively repainted in ca. 1500, although the throne seems to be largely original. Its present frame was probably executed at the time of the over-painting, which has been attributed to Andrea d’ Assisi, l’ Ingegno, who might also have been involved in Pintoricchio’s work in the Cappella Bella. The polyptych was dismembered at an unknown time and its panels were then used on individual altars. The central panel and one of the predella panels were stolen in 1970, but they were fortunately recovered in 1992. This chapel off the right transept is named for the Crucifix (17th century) on its altar. Pompeo Cocchi received payment in 1538 for painting this wooden statue of St Sebastian, which is now to the left of the altar. This detached fresco, which is from the Monastero di San Girolamo, depicts of the Madonna and Child with SS Jerome and Sebastian. The artist was a follower of Tiberio d' Assisi. This detached fresco in the chapel adjoining the Cappella del Crocifisso, which is from San Michele Arcangelo, depicts of the Madonna and Child with SS Michael and Antony Abbot. The artist was a follower of Andrea d' Assisi, l’ Ingegno. This detached fresco depicts the Madonna and Child enthroned. ✴the Coronation of the Virgin with musical angels, and the Virgin Annunciate above. This gilded silver Crucifix came from Santa Maria Maggiore. An inscription records that Prior Francesco Mili commissioned it from Paolo Vanni di Perugia. These panels came from a polyptych that was probably originally commissioned for the high altar. It was dismembered at an unknown time and its panels were then used on individual altars. This central panel and one of the predella panels were stolen in 1970, but they were fortunately recovered in 1992. Most of the panels are now in the Pinacoteca, although the central panel there is replaced by a photograph. •SS John the Baptist and Nicholas of Bari, with the Virgin Annunciate above (on the right). Their restoration revealed tiny kneeling donors that had been over-painted. •the presentation of Christ at the Temple. The central panel, which was extensively repainted in ca. 1500, is now in the Cappella dei Canonici (see above). This panel, which is attributed to Ascensidonio Spacca, il Fantino, was documented following the Apostolic Visit of 1610, when it was on the Altare del Rosario, to the right of the entrance. It was removed when the church was re-modelled in 1644-90. It depicts SS Dominic, Peter Martyr and Catherine of Siena and another female Dominican saint receiving rosaries from the Madonna and Child while, below, a pope and a group of nobles kneel in front of the choir of a church that is clearly identifiable as Santa Maria Maggiore. A small coat of arms on the cope of the papal figure identify him as the Dominican Pope Pius V, who instituted the feast of the rosary after the Battle of Lepanto (1571). This altarpiece, which is signed and dated by inscription, depicts the Madonna and Child with SS Mary Magdalene, Francis, Jerome and Raymond of Peñafort (a Dominican who died in 1275 and was canonised by Pope Clement VIII in 1601). This altarpiece, which is dated by inscription and attributed to Marcantonio Grecchi, contains a portrait of the unknown donor. 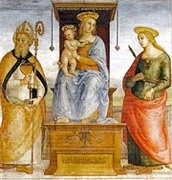 This altarpiece, which depicts the Madonna and Child with St Felix and the Blessed Andrew Caccioli, is attributed to Marcantonio Grecchi. 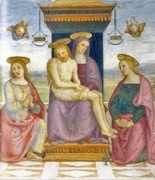 It is probably the altarpiece that was removed from the Altare di San Felice in 1930. It provides evidence that both of these saints were considered to be patrons of Spello in the early 17th century. This altarpiece, which is signed and dated by inscription, depicts the standing St Felix with two angels, one of whom holds a cityscape of Spello. This altarpiece, which is attributed to Marcantonio Grecchi, depicts the Madonna of Constantinople with St Michael (who holds the scales of justice in his left hand points the sword in his right hand at a dragon) and St Francis. These two panels from Santa Maria Maggiore are attributed to Andrea Camassei. The inscription on this reliquary records that the relics of St Felix were translated to Spello in 1783, and that Girolamo Salvini (a goldsmith from Foligno) made the reliquary in 1788. A second inscription records that the reliquary was restored in 1883. The relic in question, which came from San Felice di Giano, was probably housed in this reliquary above the Altare di San Felice. Its base contains holes for poles so that the relic could be taken in procession. The relic was moved to another reliquary that is still housed there: this might have occurred in 1883, when the reliquary here was restored.